Known by a lot of different names- Hantharwaddy, Orrisa and Pegu– along the history of Myanmar, Bago was used as the seat of power from 14th to 18th century. Often used by Mon Kings as their capital and one time capital of second Myanmar Empire around 16th century. It remained an important town during colonial time as a trading center. Bago is only 50 miles\80 kilometers distance from Yangon and can be reached from Yangon by approximately two hours drive. 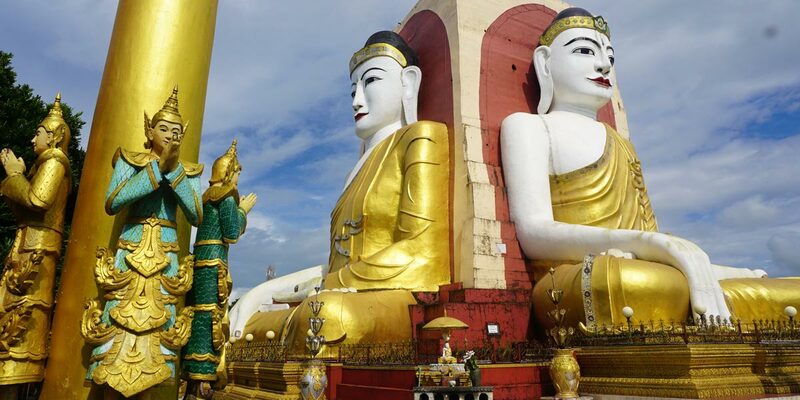 It is famous for its religious sites and serves as a simple day trip from Yangon. Golden stupa located in the middle of Bago town is said to be the tallest stupa in Myanmar with the height of over 347 ft\114 meters. The legend said that the stupa has the relics of Buddha enshrined inside. It was said to be built during the life time of Buddha, over 2600 years ago, and rebuilt around 3rd century B.C. It had to rebuild many times along the recorded history of Myanmar because it is situated inside the earthquake zone. The first of the two earthquakes were erupted in 1917 and the second was in 1930. The stupa was leveled after the second earthquake. People and the government rebuilt the Stupa around in 1952. 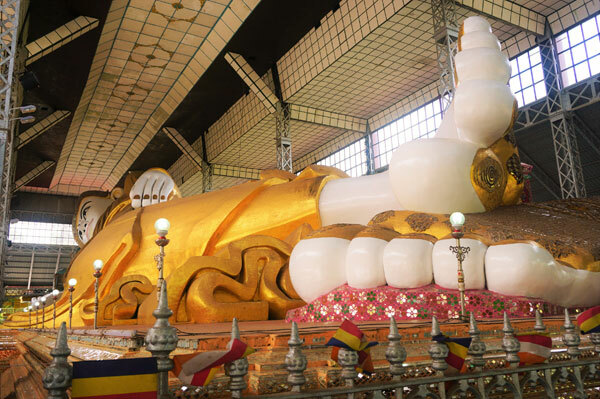 Built by the Mon King Magadeikpa in 10th century, measuring about 180ft\60 meter long Buddha image followed the design favoured by ancient people of Myanmar which is famously known as Mahaparinivana position-Buddha in lying position with the head on the pillow, is of another famous place in Bago. The King built the image to celebrate his convertion to Buddhism. It was renovated by the Kings and Queen of Myanmar, including the famous King Bayintnaung who ruled the second Myanmar Empire. It was lost and hid by the overgrown trees and bushes during the wars between Myanmar and British in the early and middle period of 19th century. It was rediscovered in 1881 by a railway contractor and renovated again with an iron pavilion above the image. 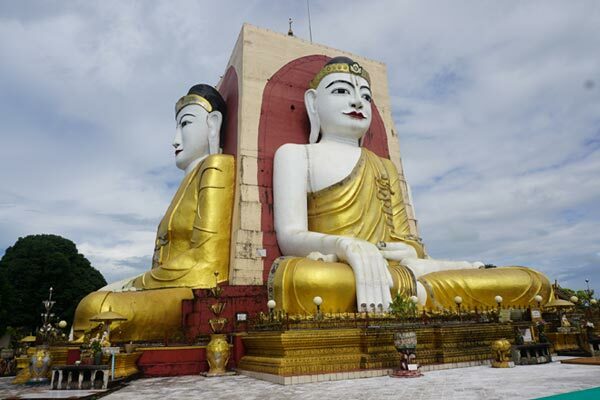 At the western part of Bago, lies another religious site, known as Kyaik Pun or four directions Buddha images. The pagoda was built by the Mon King Dammazedi (1572-92), four Buddha images in sitting position facing the four cardinal points of compass. The images are about 30m\100 feet tall. It was also destroyed by the earthquake and had to rebuild again. 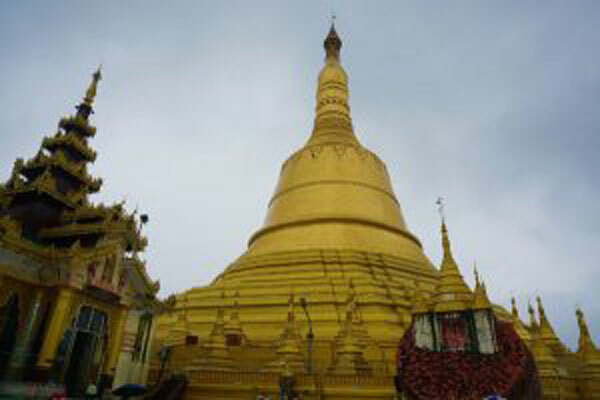 It is situated near the Bago-Yangon road and surround by small shops and monasteries. If you want to see hundreds of monks lining up for their last meal (lunch) of the day, Kya Khat Waing Monastery is one of the place to observe and visit at Bago. The monastery was used to home and study centre for over 1000 monks before 2007, however now it is learnt that about 500 monks in the centre right now. Those monks are come from different districts and regions of Myanmar. The monastery organized diverse ethnics into unity under the teaching of Buddha. The monastery is one of the most disciplines learning and practice centre. Hintha aka Hamsa is the mythical birds from Buddhist tales. A single Hinthar bird is the symbol of Mon people while two birds,one resting on the back of another, is the symbol of Bago region. According to the legend, Buddha prophesied that there will be a great kingdom when he saw two hinthar resting on a tiny island. When King Bayintnaung came to power, he built a stupa dedicated to the legend. Original stupa was destroyed by bomb during World War II. It was rebuilt by hermit U Khan Ti. The pagoda was also famous among the spirit and wizards worshippers. Sometime, visitors will experience the performance of dancers and traditional orchestra on the pagoda platform to entertain the spirits. While you are at Bago, your trip will not complete without visiting the reconstructed palace of King Bayintnaung. King Bayintnaung (1551-1581) built the second Myanmar empire, largest empire in the history of Myanmar. He decided to use the Bago as his capital,so he rebuilt the city Hantharwaddy – the city of Hinthar birds, together with the Kanbawza Thardi Palace. The palace was square shape with twenty gates on the walls, surrounded by moat. The buildings were cover with roof made of gold-according to the notes left by the people like Ralph Fitch and Venetian merchant Caesar Frederick. The city and the palace were put to fire by its enemies after King Bayintnaung’s death. The Archaeological department excavated and rebuilt the two buildings of the palace around 1995.